Powerful, in so far as it has a 5.5 CV petrol engine, and versatile thanks to its independent 2100 rpm power takeoff to which dusting pumps, compressors, etc. 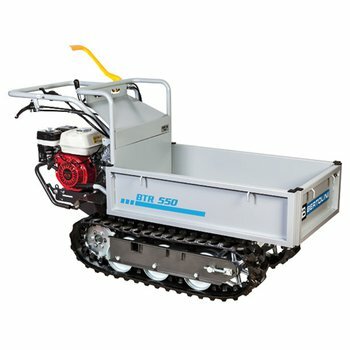 can be connected, the BTR 550 transporter is a professional machine designed with the most demanding users in mind. It is the ideal solution for transporting bulky and heavy loads wherever it is necessary to move about in spaces that are narrow and difficult to access with other motor-driven means. Equipped with a six-speed transmission (4 av. + 2 rm.) with gears in oil bath, this transporter model is extremely reliable. Combined with its sturdiness is extreme ease of handling. This is due to its compact size and above all its steering radius of only 700 mm. This feature ensures maximum freedom of movement even in small spaces such as, for example, mountain vineyards and renovation construction sites. The BTR 550 transporter is a sound ally on all types of land, even in mountainous areas. With a full load, it is able to tackle a maximum slope of 20° (40° without load). Its 180-mm-wide tracks ensure grip. Then its 65-mm minimum distance from the ground is important. Versatile. Sturdy. Easy to handle. And also safe. This machine is designed in compliance with the strictest standards. Its expandable brakes, a guarantee of endurance as they are protected from dust and grime, automatically connect when the clutch is released. In turn, the clutchreleases automatically when the operator releases the control lever.